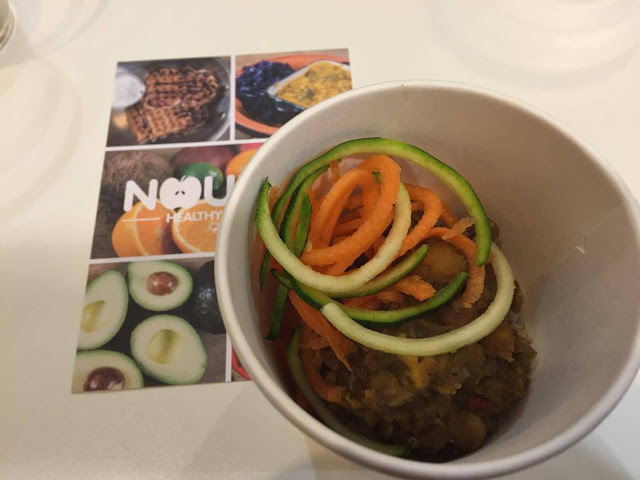 I was kindly invited to pop along to the Nourish Spring Menu Event, I had been looking forward to this for a while as I am a big fan of Nourish already. 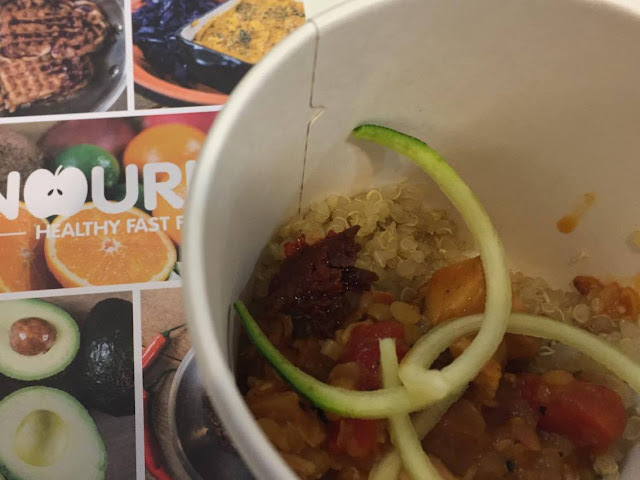 I love the tasty heathy food and the convenience of taking away healthier options, which isn't always easy to find. Before the event, myself and a few other bloggers met up. 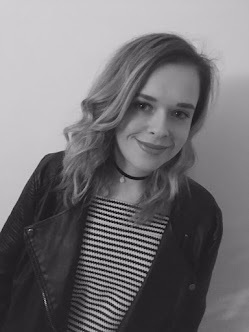 I have been super impressed as many more Sheffield Bloggers have popped up, out of the internet and are making themselves known. I am glad about the increase in numbers as we have a growing little blogging community in Sheffield. 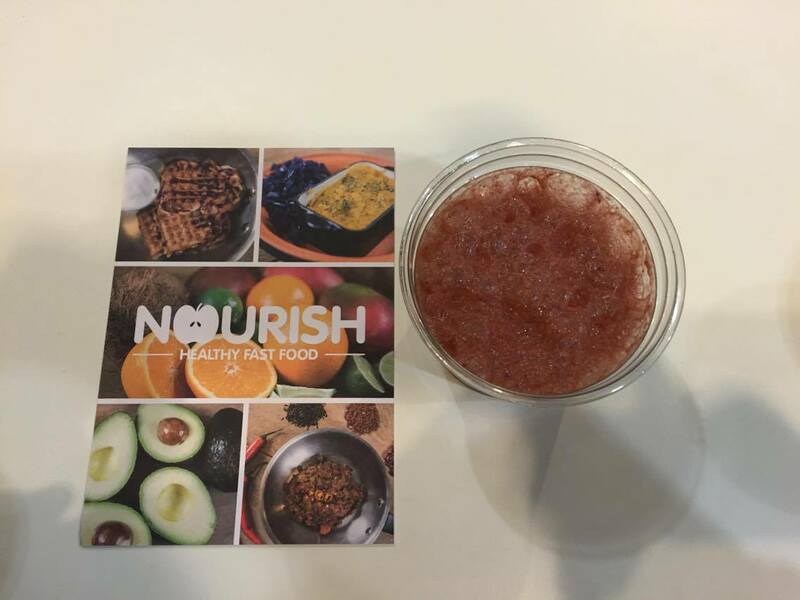 When we arrived at nourish we sat in small groups and were given two smoothies to try, the first was Strawberry and Rhubarb Pie flavoured, followed by a Berry Rombucha. Both were full of tasty ingredients which felt fresh and I imagine these would be great to have in the spring as a breakfast on the go! I usually find smoothies can sometimes be too sweet from the added sugar and sweeteners but these didn't have this downside, so I didn't feel like I needed to brush my teeth straight after drinking them. 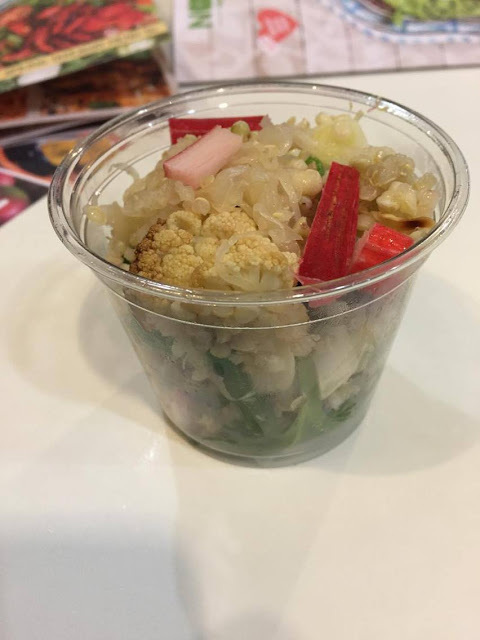 We were given a mixture of hot and cold dishes next, with a description of each when were handed them. I really liked this as there is nothing worse than having to write or talk about a dish that you like when you have no idea about its background. One of my favourites from the night was Duck 'bang bang', this contained duck with rice noodles, almond and ginger dressing, green beans and Bok Choy. 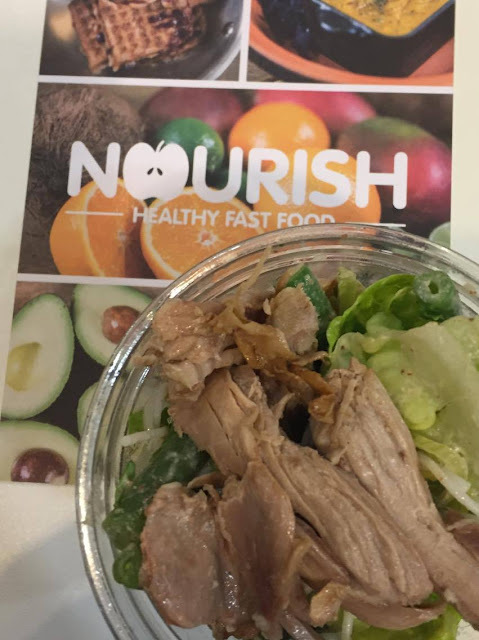 I loved how fresh the duck was in a salad and it wasn't an ingredient that I thought about putting in a salad before. The duck went really well with the almond and ginger dressing and was refreshing to see, as more often than not duck comes with hoisin sauce. I had my Spring Superfood Salad without salmon. I was glad when they gave us this option as I really don't like it (I'm unsure why, as I love seafood) so I jumped at the chance to try this dish. The picture in the menu showed that the dish contained rhubarb and I must admit when I saw this I did think it was a crab-stick, so it was a big surprise when I tasted rhubarb. I hadn't ever tried this in a salad but the sweetness and tartness of the rhubarb helped bring the dish together and added to the freshness. 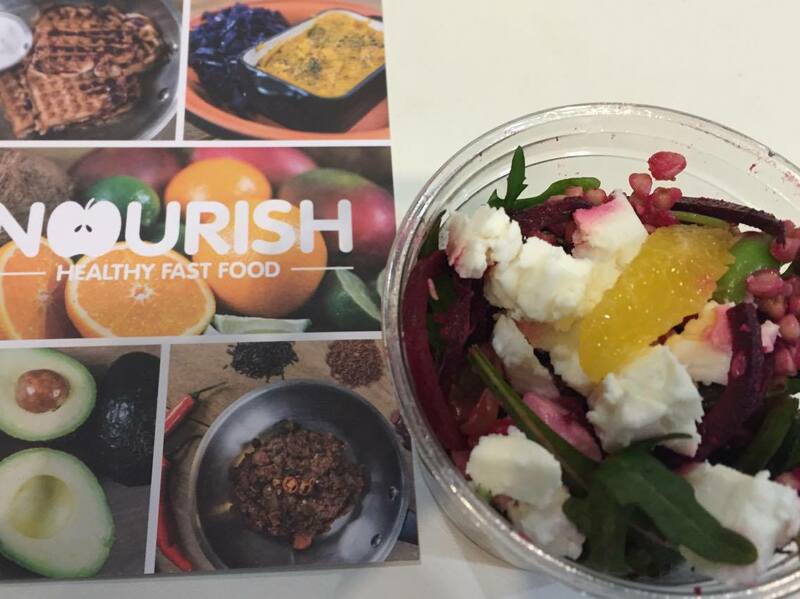 Rhubarb has been added in this salad as Nourish aim to use local and seasonal products and Sheffield is very close to the rhubarb triangle. Next, the Italian meatballs. Who doesn't love meatballs and who doesn't love meatballs even more when they are on top of a sweet potato? 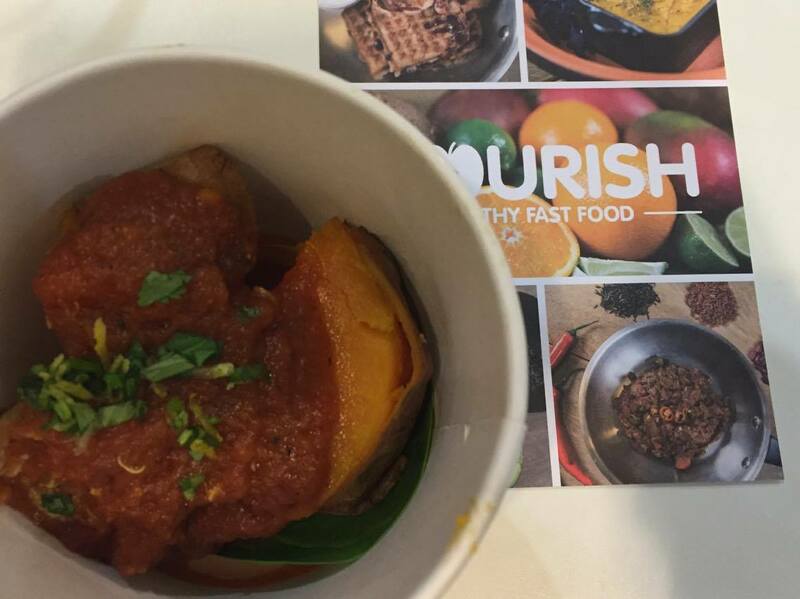 I am a huge fan of Nourish's sweet potatoes and this did not disappoint. I loved the sauce that the meatballs were in, it almost tasted sweet so is perfect for a spring menu. 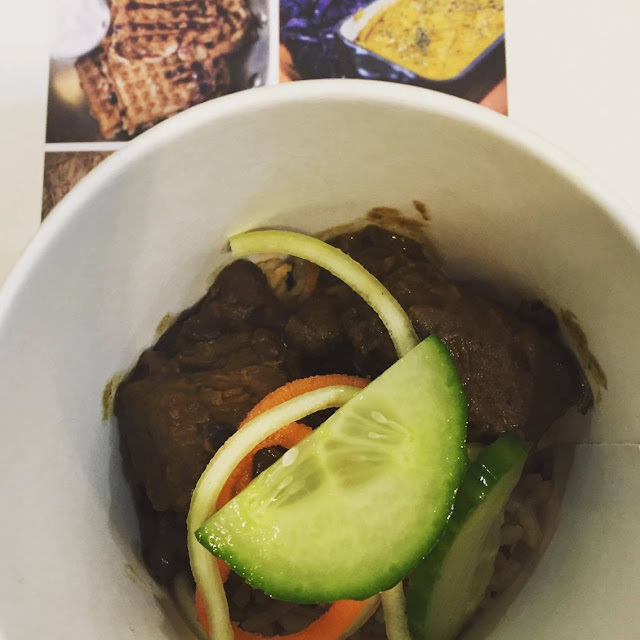 My second favourite (if I had to choose) would be Beef Rendang. I have mentioned this a lot to my boyfriend already as I couldn't stop thinking about how tasty it was. Next time I go back to Nourish I need to get some more Beef Rendang! This contained Yorkshire beef, malay spices and coconut and black beans. The beef and the flavours went perfectly together and the spiralised veg made sure this stayed light and wouldn't be too heavy as a lunchtime meal. I always find if I have something too stodgy, I just want to get something comfy on and have a lie down and this is not what you need when you have three hours left at work. The next dish was the sweet potato and vegetable masala, as I have already said I love Nourish's sweet potatoes so I was looking forward to trying this in the dish rather than it being a mere accompaniment. This dish had a little kick to it but not in an overpowering, I really need a drink of water, way, it was just a little kick which added something to the dish rather than it defining the dish (if that makes any sense). This came with spiralised veg so again this was light and perfect for when the weather finally gets a bit warmer. I couldn't believe how many dishes we got to try at this event, they just kept on coming out to us. Not that I am complaining it was great to try so much on the menu so I know which ones were my favourites and that I will go back to Nourish to have again. The chicken and red pepper tagine, I love Moroccan flavours in tagines. The flavours remind me of the summer, when you can eat your dinner outside and catch some sun! It contained apricots so this added a sweetness to the dish, I hadn't tried apricots in a savoury dish but this really complemented the chicken and red pepper. Finally, came the Lift Yourself box. This to me was spring in a salad, I really enjoyed how the feta cheese tasted with the beetroot because of how creamy the cheese was and the sweetness of the beetroot. It was really refreshing and I think if you did need a lift, this one would give it to you! 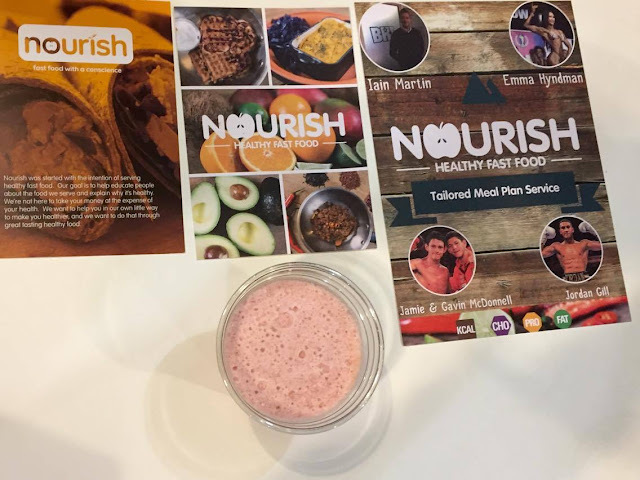 Louise, who was also at the event had been eye-ing up the Dairy Free Blueberry Cheesecake and due to her food intolerance she was unable to try a few dishes so she tried the cheesecake. I was super jealous as it looked amazing, in my goodie bag I have been given a voucher for a free desert so I will be going back to Nourish to pick up a cheesecake. Have you tried Nourish yet, if so what are your favourite dishes?